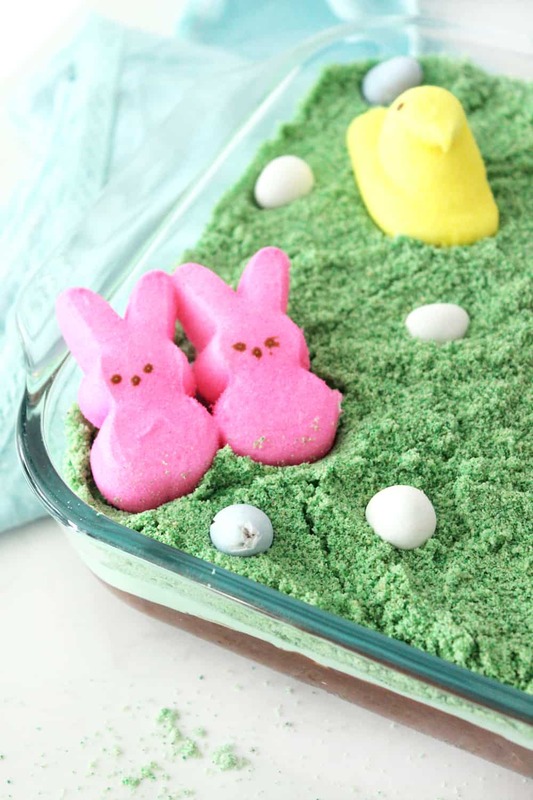 Easter dirt cake is my kids favorite of all our Easter treats! Is it just my kids or does every child feel an irresistible urge to put dirt in their mouths? I think that is the beauty of this Easter dirt cake! It is dirt they are actually allowed to eat! 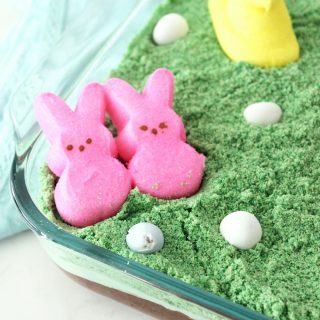 My kids love our traditional dirt cake so much that I decided to switch it up and make a fun Easter treat version with peeps and cadbury eggs instead of the traditional gummy worms! I hope your little ones love it as much as mine always do! 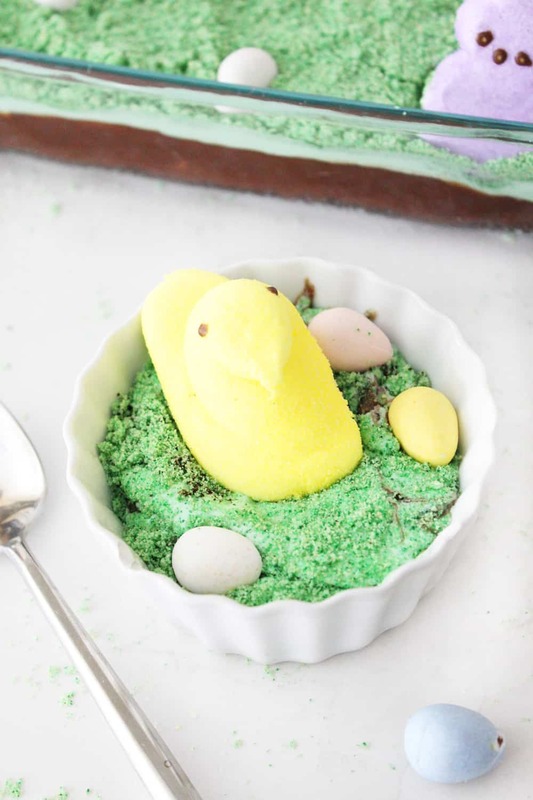 Easter dirt cake is made just like a regular dirt cake, but I have a secret ingredient in my cream cheese layer that takes this recipe over the top! 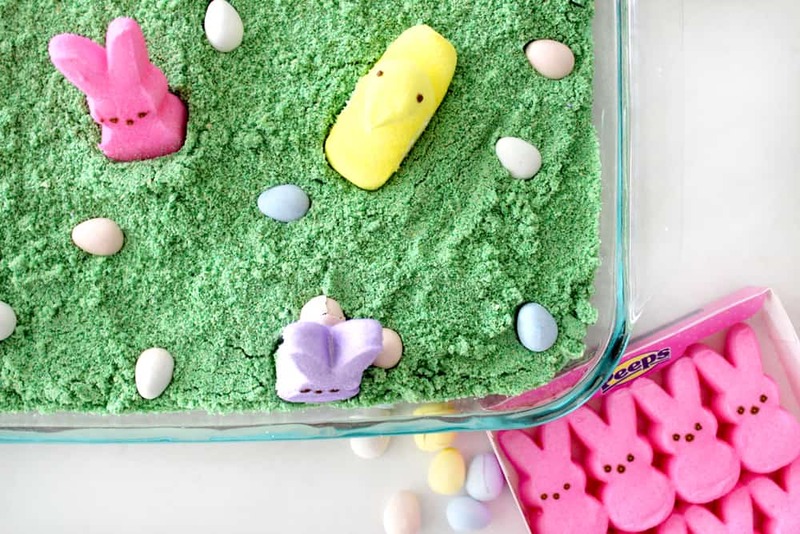 Fun and easy easter dirt cake! 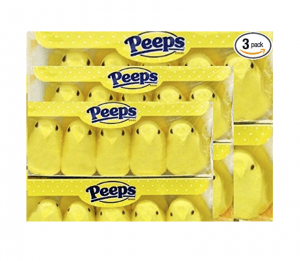 Everyone will love this delicious and festive Easter treat! First thing you’ll want to do is make your pudding mix according to package directions and stick in the fridge to set. 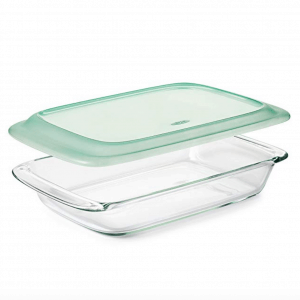 Next, process your chocolate cookies in a food processor and spread evenly on the bottom of a 9×13 pan. Spread pudding evenly across chocolate cookie layer. In a separate bowl, combine sweetened condensed milk, cool whip and cream cheese and beat until smooth. Add a few drops of green food coloring to make a grass layer. Smooth cream cheese mixture over pudding layer. Crush white sandwich cookies in food processor until crumbs and then toss in your green food coloring. 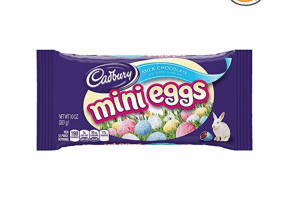 Garnish with Cadbury eggs and Peeps, (the kids will love helping with this part)! Enjoy! Here’s a picture of what all the stages look like! 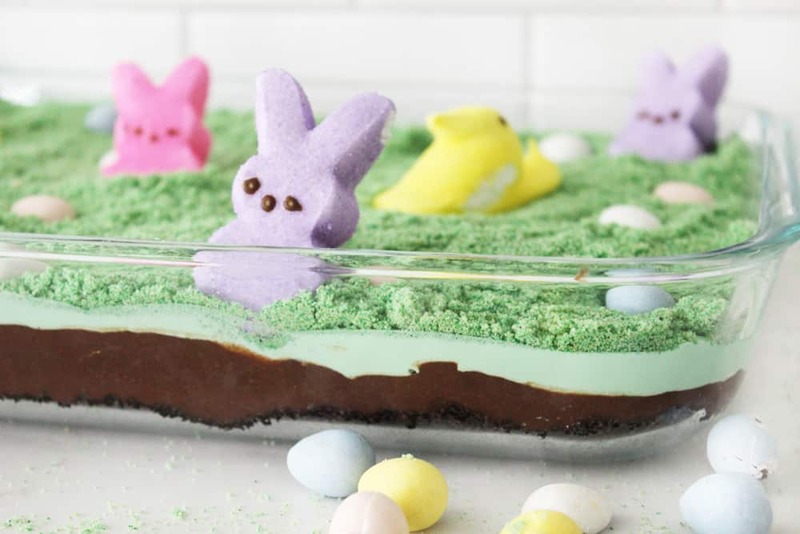 This Easter dirt cake is super rich too, so you really only need a little bit to curb that sweet craving! If you like this recipe then you will also love these other fun and festive Easter treats! 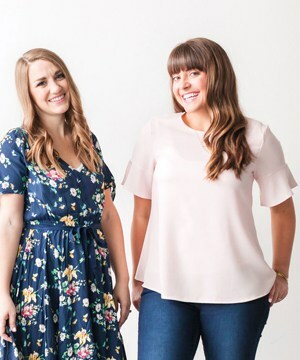 *This table contains affiliate links. If you liked this post you will also love avocado deviled eggs and 25 fun and festive Easter treat ideas! This post was originally published March 26th, 2014 and has been updated. My mom used to make dirt cups… I love the idea of switching the worms out! Aw thanks Vanessa! That means a lot coming from you! 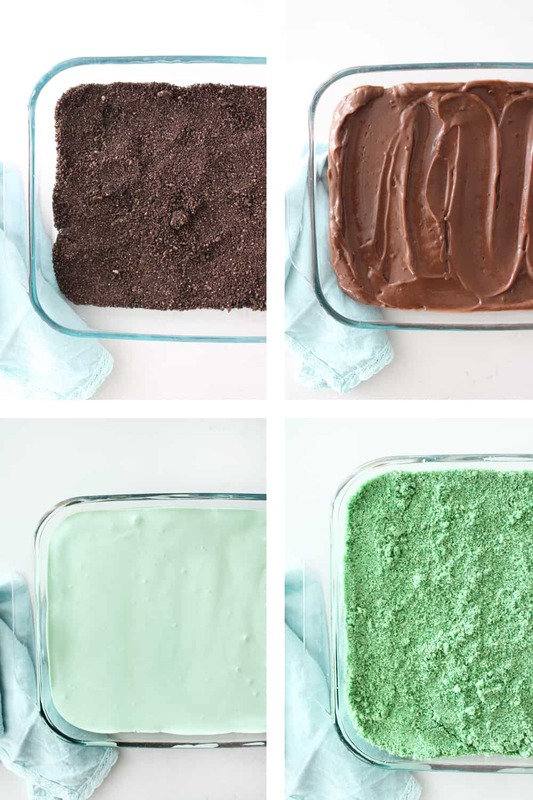 I remember having dirt cake before, but I could never find the right recipe to replicate it. I’ll try yours out and see if it’s the same. Yours looks great with the crushed cookie topping!